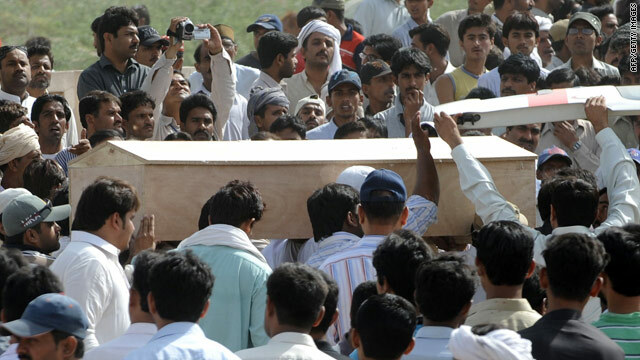 Pakistani Ahmadi community members carry a coffin of a victim during a funeral ceremony on May 29. Islamabad, Pakistan (CNN) -- Pakistani authorities are blaming Friday's deadly attacks in Lahore on militants with ties to the Pakistani Taliban. Akram Naeem, spokesman for the Punjab police, said the attackers are terrorists from the Waziristan tribal region of Pakistan, where the Pakistani Taliban group maintains a strong presence. Interior Minister Rehman Malik said there had been intelligence earlier in the month that an attack could happen in Lahore and that Punjab police did take some steps to react. Then on Friday morning, attackers with bombs and firearms targeted houses of worship in Lahore belonging to the Ahmadi sect, a persecuted religious group. The death toll stood at 98, officials said Saturday, and dozens more were wounded in the attacks. Most of the dead -- 75 -- were killed at the place of worship in the Model Town neighborhood. The remaining 23 were killed in the Garhi Shahu neighborhood, he said. The movement was founded in 1889. Its followers believe that Mirza Ghulam Ahmad, who lived between 1835 and 1908, was sent by God as a prophet "to end religious wars, condemn bloodshed and reinstitute morality, justice and peace," the worldwide Ahmadi group says. The group, which is thought to number between 3 million and 4 million people in the country, endures "the most severe legal restrictions and officially sanctioned discrimination" among Pakistan's religious minorities, according to the U.S. Commission on International Religious Freedom. The agency says it's illegal for the group to preach publicly, pursue converts or pass out religious material, and adherents are restricted from holding public conferences and traveling to Saudi Arabia for the hajj pilgrimage.